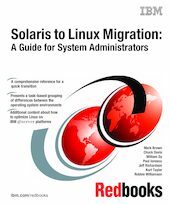 The goal of this IBM Redbooks publication is to provide a technical reference for IT systems administrators in organizations that are considering a migration from Solaris to Linux-based systems. We present a systems administrator view of the technical differences and methods necessary to complete a successful migration to Linux-based systems, including coverage of how those differences translate to two major Linux distributions: Red Hat Enterprise Linux and SUSE Linux Enterprise Server. The book is designed primarily to be a reference work for the experienced Solaris 8 or 9 system administrator who will need to begin working with Linux. It should serve as a guide for system administrators that need a concise technical reference for facilitating the transition to Linux. The book also provides details about how to leverage the additional industry-leading technologies in IBM eServer xSeries servers, IBM POWER technology-based systems (iSeries/pSeries), and IBM eServer zSeries systems that make them very powerful and flexible platforms for hosting Linux-based solutions.